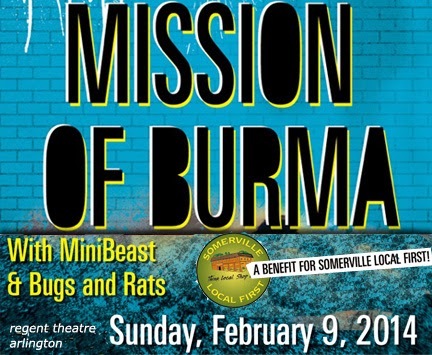 The Regent Theatre in Arlington and Somerville Local First announced today that renowned post-punk band Mission of Burma will be playing a benefit concert for Somerville Local First on Sunday, February 9, 2014 at the Regent Theatre in Arlington. This will be Mission of Burma's first Boston show in over a year and the only area scheduled performance in 2014. Minibeast, featuring Peter Prescott of Mission of Burma, and Bugs and Rats, from Quincy, MA, open. Mission of Burma's performance kicks off the first annual benefit show for Somerville Local First, a non-profit organization committed to supporting a diverse economy in Somerville, Massachusetts that is local, sustainable and fair. Funds raised from this concert will help support Somerville Local First's efforts to help launch and nurture the development of independent businesses in the city. Sam Adams Brewery, Craft Brewers Guild and DigBoston are sponsoring this event. Additional local sponsors are Q's Nuts, Dave's Fresh Pasta, Daddy Jones Bar, Taza Chocolate, Magpie, and Olde Magoun's Saloon. Ticket Information: Tickets are $27.00 and $22.00 (includes $3.00 restoration fee) and can be purchased through the Regent Theatre Arlington online or at their box office located at 7 Medford Street in Arlington, MA, 781-646-4849. Doors are 7 PM with show time at 7:30 PM. This is an all ages show. Beer and wine will be available for purchase by those 21 and over with proper I.D. "I'm so excited and honored that Mission of Burma is lending their time and influence to the local movement. As local heroes themselves it's great that they are supporting us in our mission to provide assistance to locally owned, independent businesses in Somerville." said Kat Rutkin, Executive Director of Somerville Local First. Leland Stein, Manager of the Regent Theatre Arlington added, "I've been a big fan of Mission of Burma since its early days and am very excited that the Regent is hosting this as our first major concert event of the new year. And, as supporter of the "shop local" movement - and the co-owner of a business that contributes significantly to the local economy - the fact that it's a benefit for Somerville Local First is a bonus." Roger Miller (vocals, guitar) Clint Conley (vocals, bass) Peter Prescott (vocals, drums) and Martin Swope (loops) initially formed this internationally known post-punk band in 1979. They reunited in 2002 after a nearly 20-year hiatus with Bob Weston replacing Swope. Widely credited with influencing bands such as Nirvana, the Pixies, R.E.M., Sonic Youth, and Yo La Tengo among others, Mission of Burma has released five studio albums - Vs., ONoffON, The Obliterati, The Sound The Speed The Light, Unsound, and their live album, The Horrible Truth about Burma - all to critical acclaim. They have also issued the Signals, Calls and Marches EP and a number of singles. Unsound, their latest album, was released in 2012. The musical creation of Peter Prescott, (Mission of Burma, Volcano Suns, Kustomized and Peer Group), Minbeast combines surf, psych, punk, easy listening, 60's children's music, and soundtrack influences to create instrumental soundscapes. Minibeast released their firstself-titled vinyl album this year and became a four piece rock unit to play live performances. Prescott is joined by Gillian Chadwick (guitar), Alec Redfearn (bass) and Rick Pelletier (percussion). Hailing from Quincy, Massachusetts and "making childish noise since 2003", Bugs and Rats is Shawnie Brando (guitar/vocals), Kellzo (drums) and Radek Weirzbowski (bass). Playing together since high school, Bugs and Rats' music supports liberation of the soul through their uncompromising adherence to unforgiving minimalism. Bugs and Rats has released three albums,Smart as a Whip (2004),Adidas (2010), and Get That F***ing Light Outta My Face (2012) as well as a number of singles and EPs. They plan on wrapping up a new record this winter, which moves their sound into even louder, harsher territory. About Somerville Local First: Celebrating all things local, Somerville Local First is a non-profit organization that is committed to supporting a diverse economy in Somerville, Massachusetts that is local, sustainable and fair. Its mission is to increase the ability of independent businesses to thrive in the community by supporting one another while protecting the well-being of future generations. Somerville Local First's efforts make it possible for local dollars to work harder. For every $100 spent locally, it generates an additional $45 in secondary spending versus $14 from big box stores. More information about Somerville Local First can be found at www.somervillelocalfirst.org. About the Regent Theatre Arlington: The Mission of Burma Benefit Concert for Somerville Local First will be presented at the historic Regent Theatre, located at 7 Medford Street (off Massachusetts Avenue) in Arlington, Massachusetts. Conveniently located minutes from Cambridge and Boston, the Regent Theatre is MBTA and handicap accessible with free parking in the municipal parking lot across the street. Reserved seats may be purchased for $22 or $27 online at www.RegentTheatre.com, by calling 781-646-4849, or in person at the Regent Theatre box office. This is an all ages event, but beer and wine will be available for purchase to those 21 and over with proper I.D. 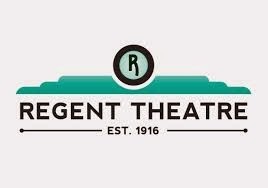 More information about the Regent Theatre Arlington can be found at www.RegentTheatre.com.